The cruise terminal in Brooklyn, New York is located in Red Hook, opposite Governors Island. The 200,000 square foot terminal can handle 4,000 passengers. The Brooklyn terminal complex includes a rebuilt building, bollards and fenders, an internal roadway, a 500-car parking area, and taxi and bus drop-off areas. 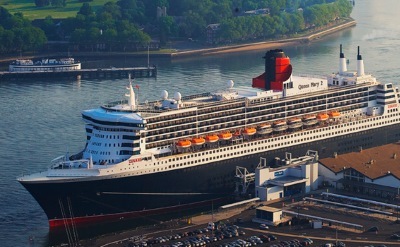 Browse Brooklyn cruise terminal reviews. There are several hotels near the Brooklyn cruise terminal. They range from large luxury hotels to small boutique hotels. The interior spaces are large and open; ideal for events. 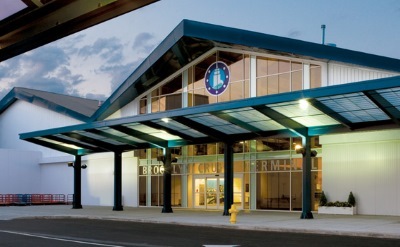 Learn more about cruise terminal events. From Coney Island to the Botanic Gardens, Brooklyn has a surprising number of attractions for cruise passengers to explore before or after their voyage. The restaurants of Brooklyn Heights, art in DUMBO, the Brooklyn Museum in the Slope, and the nightlife of Williamsburg are all part of the new Brooklyn charm. The Tourism office has a terrific tour guide to Brooklyn. One thing that is fun to do is a dinner cruise. The cruise terminal has it's own parking, but you should consider taking a taxi instead. Why try to deal with New York traffic on your own? Parking is about 300 yards south of the terminal entrance. The outdoor lot has security. Directions to Brooklyn Cruise Terminal: complete directions provided at the NYCruise.com website. More about transportation to and from the cruise terminal. There is no subway station nearby. Here's an interactive Google Map of the Brooklyn Cruise Terminal area. The terminal is on Pier 12, the large docks directly across from Governor's Island.